A press conference was held last week to announce that Vinik's massive tax hike to raise Hillsborough County sales tax rate to 8% - the highest in the state - will be on the November ballot. Where was this press conference held? In front of a drive in movie theater on Hillsborough Avenue - deceptively far away from Vinikville and the gleaming downtown towers. Far away from the wealthy five Vinik associated donors who donated $750K to spend over a HALF a MILLION dollars to paid petition gatherers to get Vinik's $15-18 BILLION massive tax hike on the ballot. A small group of Tampa transit advocates stood on the roadside proudly announcing they want taxpayers to fork over more of their hard earned money for bigger government for 30 years. The smiling urbanists looked so happy to have the opportunity to tell county taxpayers to hand the county a 100% sales tax revenue increase to pay for costly transit and constrain roads for 30 years. 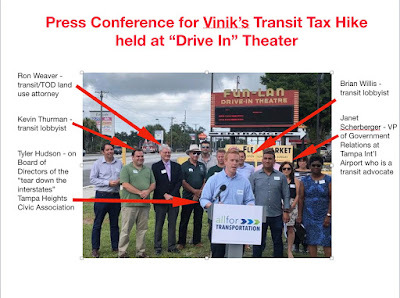 Tyler Hudson, the Chair of the Vinik funded All for Transportation (AFT) PAC spoke at the roadside drive in theater press conference. We reported previously that Hudson is on the Board of Directors of the Tampa Heights Civic Association who fought and shut down FDOT's TBX interstate project. Hudson is a member of the "tear down the interstates" crowd, as the Times reports, who supports tearing down 10 miles of I-275 from downtown to Bearss Avenue and replacing the interstate with a boulevard and a train. Vinik and his downtown allies are now directly tied to the Tampa urbanists who want to tear down our interstates - that serve as a major evacuation route in Tampa Bay and 200K people use everyday. Vinik and his downtown allies are now directly tied to the Tampa urbanists who want to prohibit building new roads or adding new lane capacity in Hillsborough County for 30 years. Hillsborough County is estimated to grow by about 800K people over 30 years with the vast majority in unincorporated Hillsborough. But Vinik's absurd $15-18 BLLION tax hike specifically PROHIBITS building new roads and adding new lane capacity in Hillsborough County for 30 years. What bad judgment! Vinik's massive transit tax hike is worse than the rail tax that was overwhelmingly defeated in 2010. Vinik wants his costly trains to enrich him and greatly increase the value of his [Under] Water Street real estate development aka as a taxpayer funded bailout. The Tampa urbanists want costly rail and want to force us out of our cars and vehicles by constraining roads and creating more congestion. So the press conference by those who want to constrain roads and spend BILLIONS on costly rail projects is held at a drive in move theater where customers drive their cars and sit in their cars while they watch the movie.